If you want to use ADB and Fastboot, sideload an APK or Zip, flash a custom recovery or the stock factory images, access and control your Android device using a computer, you’ll need to enable Developer Options and turn on USB Debugging. Without having them enabled, Android devices just can’t communicate with the computer. Here’s how to enable Developer Options on Android devices from different manufacturers. 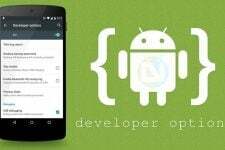 One of the things that make Android distinct as an operating system for smartphones and tablets is its being an Open Source platform that encourages developers to engage in various types of development activities. 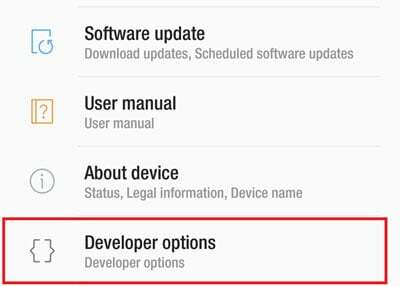 And the one feature without which the custom development would not have been so easier is the availability of the “Developer Options” that is found under Settings of all Android devices. Let’s learn how we can enable Developer Options and turn on USB Debugging on Android devices running Android KitKat, Lollipop, Marshmallow, Nougat, Oreo and Pie. 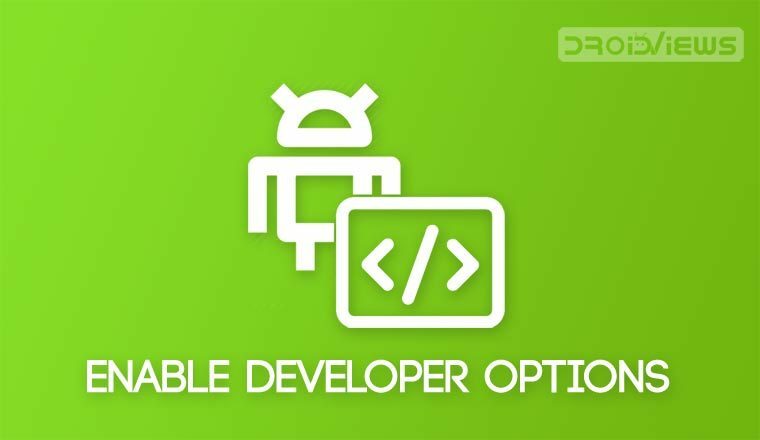 These developer options contain advanced features that help any person with a developer’s bent of mind to build, test, debug, and package Android apps and mods. In simple terms, developer options allow quick access to an Android device from a computer via ADB (Android Debug Bridge) commands. The “Developer Options” feature is indispensable to Android developers, hackers, and enthusiasts as a means to quickly access and control their device via desktop. Even if you are an average user and wish to root, install a ROM or mod on your Android device, you must turn on USB Debugging mode on your phone or tablet. And you’ll not be able to do it unless you enable Developer Options on your device first. Draw debugging information on the screen such as layout bounds, updates on GPU views and hardware layers, and other information. In fact, the developer options lie at the core of Android development and so they cannot be removed as long as Android is an open source environment. The only change Android 4.2 brings in connection with these useful options is that now they are hidden by default and you will have to make it available by doing some finger exercise. Open Settings> About device or phone> Software info on your Samsung Galaxy phone or tablet. After tapping the Build Number 7 times, you will see a message “You are now a developer!” or “Developer mode has been enabled”. Return to the main Settings menu and now you’ll be able to see Developer Options. Open it and you will find OEM Unlock and USB debugging options there. You can now enable or disable the options. Open Developer options and tab the toggle icon against USB Debugging option to enable it. To enable Developer Options, go to Settings> Developer options and tap on the ON/OFF slider on the top of the page. Then tap “Build number” seven times to enable Developer options. Finally, you will see “You are now a developer!” message on the screen. It is not obvious why Google decided to hide the “Developer options” on the latest version of Android. I guess they might have done it as a warning for noobs but whatever the reason might be, you can easily turn on the Developer Options and enable USB Debugging mode in a fun way using the above method. 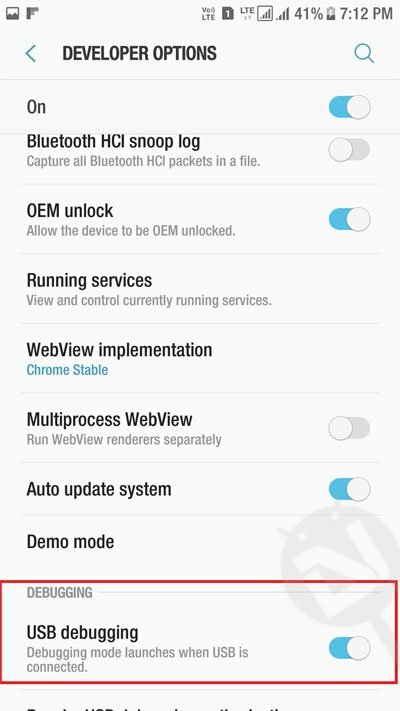 Once activated, the Developer Options on devices with Android 4.2/4.3/ 4.4 remains visible. If you want to hide Developer Options on your device, read this tutorial. I am unable to get “the take bug report” tab , on OPPO F3, even if i have the developper option enable. i have moto g3 & it’s running lollipop 5.1.1 how can i access internet through usb cable from my personal computer.please help me!!!!!!! Thank you very much! This was a very helpful tutorial. i have a Samsung Galaxy Tab Pro 12.2 and it’s running KitKat 4.4.2 How do I enable Developer Options on it ? I have tried the tapping 7 times on the Build section but it hasn’t worked… Help! I’m so glad this community is so warm and friendly. The idea that every single person needs to be a power user and never make a mistake just isn’t common here, is it? So glad that LUCIFER, the prince of doucheness can give us all a wonderful perspective on life. What have YOU done, LUCIFER? Why is your life so empty that you have to demean others? Galaxy S5 with 4.4.2, can’t get thru to Developer Options.Tapping makes a K appear and start to spin but nothing about how many more times will become a developer. Then I get stuck at the KitKat logo screen but nothing else. Any advice? Brian, you are tapping Android version. Tap “Build number” 7 times and you will be able to enable developer options. Brilliant! Thank you – sometimes I’m TERRIBLE at following directions. 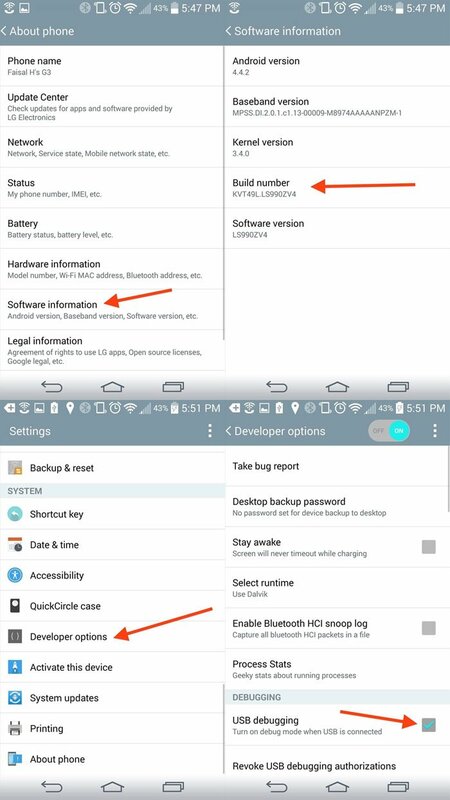 setting–>about phone and in about phone option there is Build Number option is missing. Kindly help! It could be available as Build version too. Which phone do you have? How to off the developers mode? Sorry, I am unable to get what you want to say. Thanks! Will DN4 ROM work on my Galaxy Note 2 SGH i1317 now that it has been rooted and do you have install instructions? I am not sure that DN4 ROM is available for the AT&T Note 2. 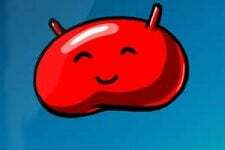 To install a custom ROM, you also requite to have a custom recovery installed. Lucifer believe me I have been tempted to spike my LGL15G Sunrise more than once in the past 24 hours. It got hung in a boot loop literally on the anniversary of my activating it , shut down as the warranty expired. The Smart Talk rep said sorry nothing we can do other than sell you a new phone that we can transfer your account balance to if you choose to buy and continue straight talk service. Not only do I have the boot loop, I also have the McAfee Kill switch that stops a factory reset, bootloop is stopping me from getting to settings, where I could turn on USB Debugging, giving me a window to the software, and access point to repair the thing. I’m thinking about telling Straight talk and McAfee both that I’d be fine if they stuck their LG Sunrise where the sun don’t shine. 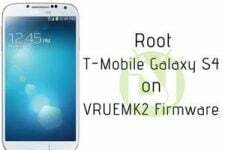 Hi Rakesh ji, can plz you upload a video for lg g2 sprint ls980 how to root and unlock the device step by step? I tried a lot using the method but get too much confusions, not sure what to do. PLZ help me. Thanks for informing us. There are various blogs that steal content from our site. 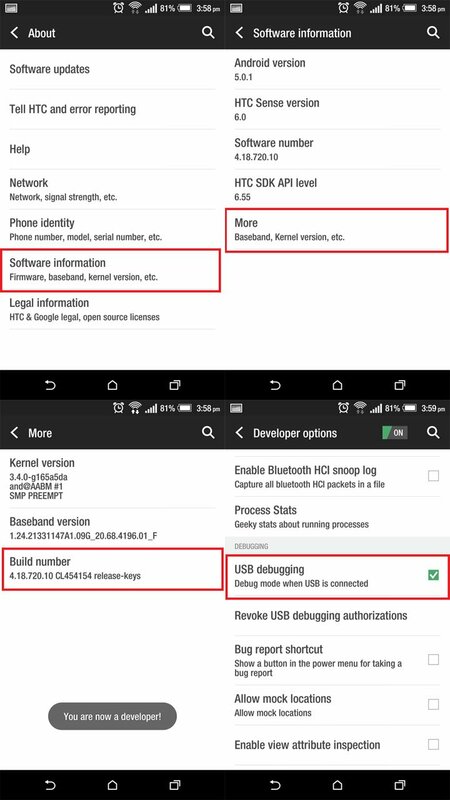 my htc one is running CM 11 but its not working properly. it is stuck on the boot loop so is it possible to turn on usb debugging another way? Nope. Do you have the backup of your previous ROM? Thank you for the information for my HTC One! Good support to learners..I love this site…GREAT…. ty,it says can cause apps to misbehave or break the device ,is lookout android security a good app? Hi, I always recommend keeping it ON whether you do any custom development job or not as it might prove a lifesaver in critical situations. Open About and tap on Build Number. I did it many times. It works on all devices with Android 4.2.